Pressure washing is a home maintenance task that can make a big difference in the way your house looks. Before you take on any major tasks that have to do with the aesthetics of your home, invest in pressure washing first. You may be surprised to find that all it needed was a good cleaning. Many of the exterior surfaces of your house can be safely pressure washed. Your walkways, sidewalks, and driveway are all exposed to the elements day in and day out. This can lead to them looking stained, dull, and dirty. Many of the common stains that make the concrete around your home look bad can be cleaned with pressure washing. The pressure from the washing will not damage the concrete. Be sure and choose the correct type of cleaning solution for the project so you do not unintentionally discolor the surface. Brick is another type of building material that can benefit from pressure washing. If the brick or mortar on your house is a light color then dirt and grime can cause it to look dull. 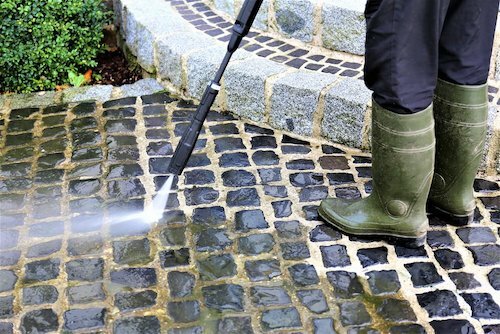 Pressure washing can really brighten up the brick on and around your house. When doing this project, you have to be meticulous about getting all of the crevices for the best results. If you have stucco on your house then pressure washing is a good first step toward sprucing up your exterior. In order to safely pressure wash a stucco house you need to inspect it for damage first. Stucco can handle pressure washing but only if it is in good condition. If you find damaged areas on your stucco, deal with them before you start a pressure washing project. You can pressure wash the wood on your house or your deck. As with stucco, you need to inspect the painted wood on your home for damage. Chipping paint will likely be blown off during the pressure washing process. So if your goal is to simply get your house clean then you need to address the damaged areas first. If the peeling or cracking is isolated to a small area then simply repair that part of your home and then have it pressure washed. There are a number of different types of siding used on houses today. Three common types of siding on houses are wood, aluminum, and concrete. Most types of modern siding materials can handle pressure washing without incurring damage. If you are unsure if the material on your house can handle it then have it look at by a professional. Pressure washing is a quick and relatively inexpensive project that can transform to look of your house. You can attempt to do this project on your own or hire a painting professional to do the work. Either way, it is a great option when you want to freshen up the look of your house without undertaking a huge home maintenance project.